Our desire is to help the people we serve reach a higher level of health, self-esteem and well-being by enhancing their dental fitness, comfort and appearance. We achieve this by providing dental care of the highest quality, consistent with our patients’ needs and values for health. The goal of health centered dentistry is to help you keep all of your teeth for the rest of your life with good health, comfort, appearance and function. In our practice, we consider it far better to provide preventative dental care, rather than to simply treat diseases after they occur. We begin with a careful examination and diagnosis. 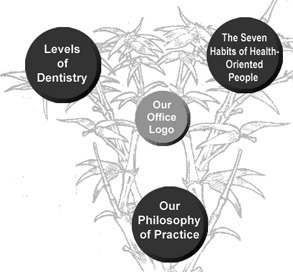 Then, we develop a Master Plan for your dental health. We realized that everyone has unique needs. We will analyze and address your situation objectively and honestly, while carefully considering your feelings and preferences. We keep up with the latest dental technologies and practices. When we say that we offer comfortable dentistry focused on your needs, we sincerely mean it. Every treatment is performed with minimal impact on you and your teeth’s underlying structure. Dr. Grablin’s patients appreciate his kindness and attention to their personal comfort. Many of his patients have fallen asleep in his dental chair. This is a metaphor for life. It often takes long, careful planning and hard work to begin to see positive results. Do not give up before the miracle. If you are interested in preventative dental care, Gary A. Grablin DDS, looks forward to helping you. Please call: (415) 454-3222 to set up an appointment. Dentist Gary A. Grablin, Health Centered Dentistry of Marin, specializes in preventative dental care and dental fitness, including: aesthetic and cosmetic dentistry, TMJ and restorative dentistry, microscopic dentistry, crowns, mercury-safe dentistry, Gnathology and Clifford Reactivity Testing for chemical sensitivity. His office is in downtown San Rafael.